The North American arm of Fiat has recently announced that the first deliveries of the limited edition Fiat 500 Prima Edizione have begun. 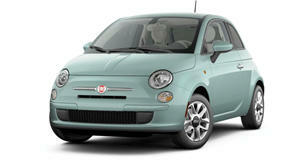 The special edition represents the first Fiat vehicles to be sold in North America since 1984, and the models are offered in three colors: Bianco, Rosso and Grigio. The special edition will be fitted with Fiat&apos;s state of the art MultiAir 1.4-liter four-cylinder engine mated to a manual transmission. Since the Fiat 500 Prima Edizione is designed as a collector car, each one wears a sequentially numbered vehicle identification number and unique numbered matching badge on the instrument panel. The head of Fiat&apos;s North America division stated that the Prima Edizione marks the "exciting and long-awaited return of the Fiat brand and true Italian automotive design to North America."